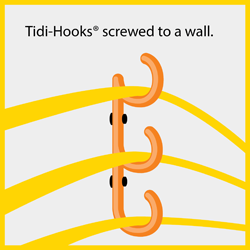 Tidi-Hooks® are simple, easy to use cable hooks for walls and ceilings. They’re highly visible and are a quick solution to trailing cables in any work place. 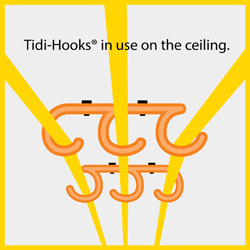 Most customers run Tidi-Hooks® at high level along corridors and walk ways and run cables from one to the next. This keeps them off the floor and completely removes the risk of people tripping over them. The hooks on Tidi-Hooks® are designed so that they can also be used on ceilings. 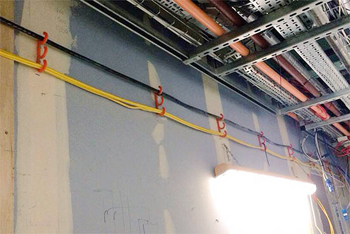 The image below was taken from a Mace Group project in London where they are using Tidi-Hooks® all over the site to keep 110v cables out of harms way. Because they can also be used on ceilings, some customers have started using them as a permanent alternative to cable trays. Each cable hook for walls can hold up to 10 kilograms of weight and with an internal diameter of 2.5 centimetres, you can easily fit 15 x 110 volt arctic cables. They can also fit larger power cables and hoses if required. We stock cable hooks for walls and ceilings in highly visible orange, with any other colour available upon request. 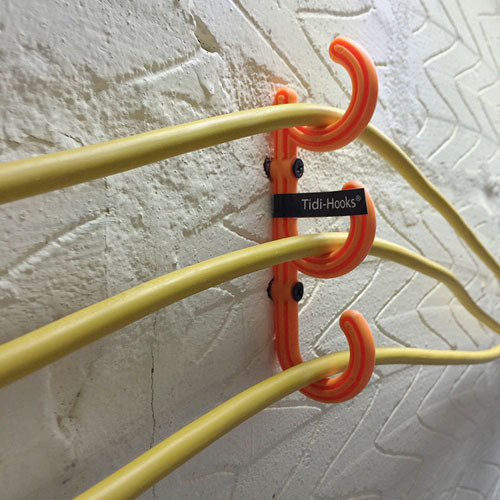 Why not make your site safer with Tidi-Hooks® in your company colours? 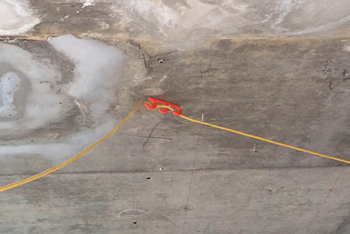 All of our cable hooks for walls and ceilings are manufactured in the UK from the best possible components and using them will ensure that you’re taking the ‘reasonably practicable’ steps to keep your site staff safe.